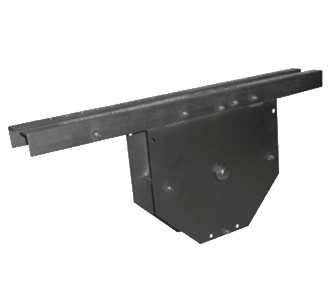 The Underhung –59 Series is an underhung style head block with fully enclosed sheaves. Typically the Underhung –59 Series is supported by two structural I-beams. Depending on the application, these head blocks may need to be welded into position after final alignment. ASTM Class 30 grey iron or nylon sheave. Equal pitch diameter on rope and cable grooves for smooth operation. Base angle legs turned in to allow close mounting centers. 10-gauge side plates fully enclose sheave; 16″ (40.6 cm) blocks have 7-gauge side plates. Side plates are bolted and welded to the base angles for extra strength. Six spacers between the side plates, three prevent cables from escaping the sheave grooves. Base angles punched with alternating slots and holes for simple easy installations. Mounting clips available, please provide steel dimensions. Underhung blocks may need to be welded to head beams after final alignment. Clip angles are recommended for double beam mounting. Mounting with clips or to single beams will require welding. Consult the factory for specific information. Head block capacities are affected significantly by mounting conditions, please see the tables in the Ordering section for additional capacity information. Wire Guide Blocks: Change the “R” suffix to “W” in the part number for blocks with tieoffs for arbor wire guides. Tieoffs: Tieoffs for wire guided clews are also available. RWL: The recommended working load (RWL) is maximum load that can be applied to a block which is in “like new” condition and has been properly installed, maintained and operated. The mounting of the head block has a major effect on the RWL, as shown in the tables.